Featuring Rachael Gates, author of "The Owner's Manual to the Voice: A Guide for Singers and Other Professional Voice Users"
Thank you to everyone who attended the workshop with Rachael Gates! Attendance is FREE. Volunteer donations will be taken at the door. FREE parking is available in Lot F only. Singers must equip themselves with enough knowledge to clearly convey specific sensations and difficulties with their instrument. Understanding of potential dangers and disorders, familiarity with a variety of medical procedures, and comprehension in various facets of diagnosis and treatments empower singers to "own," just like other musicians, their instrument. The Owner's Manual to the Voice provides singers with the knowledge necessary to communicate effectively and in intelligent terms about their instrument, especially when conversing with medical professionals. The first 20 people registered at the door will be entered in a raffle for three signed copies of Dr. Gates’ book! Download an event poster here! Enter discount code 28862 to receive 20% off! 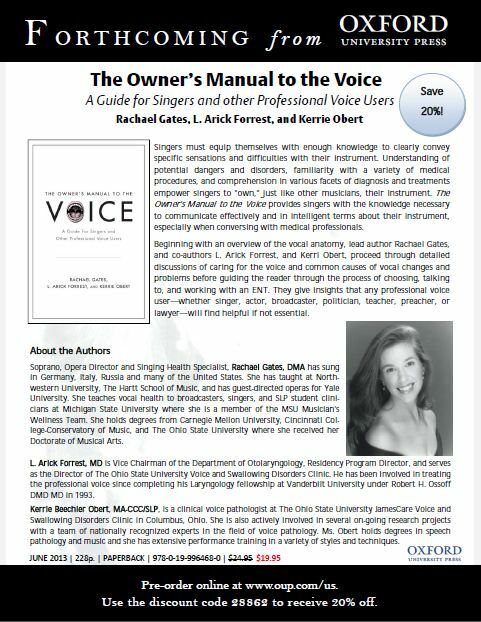 Beginning with an overview of the vocal anatomy, lead author Rachael Gates, and co-authors L. Arick Forrest, and Kerri Obert, proceed through detailed discussions of caring for the voice and common causes of vocal changes and problems before guiding the reader through the process of choosing, talking to, and working with an ENT. They give insights that any professional voice user—whether singer, actor, broadcaster, politician, teacher, preacher, or lawyer—will find helpful if not essential.